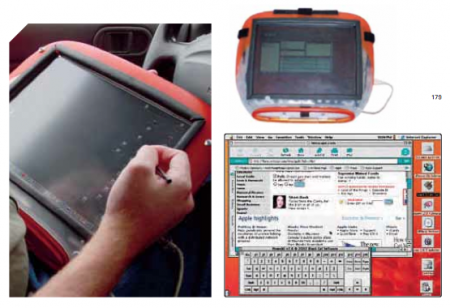 Before the iPad? The iBook tablet mod. Paradiso, a graphic designer from Boston, took a touch-screen iBook (an after-market modification from Troll Touch), disassembled it, cut a screen-sized hole in its lid, and flipped the screen around so that it faces outwards instead of towards the keyboard. Paradiso changed the desktop icons to large buttons and uses the operating system’s built-in, on-screen keyboard to get around. After the Web Pad’s construction, Paradiso posted pictures of the iBook’s progress from weird, sturdy notebook to practical tablet. It’s all a bit like Axiotron’s Modbook idea, except built in true DIY fashion. And it was from several years ago, when an iBook G3 was still a capable web-surfing, video-watching Mac. Today you’d have to do it with a Macbook. Posted by davelawrence8 at 6:49 am on August 9th, 2010. No comments... » Categories: ibook. Tags: G3, ibook, inkwell, mac, mod, pad, tablet, touchscreen. Subscribe via RSS.